Although Reggie Jones began his career in the world of cheese in product development and quality control, he dreamed of being able to develop his own small-batch artisan cheeses. Located in the beautiful central coast region of California, Jones now specializes in aged cow, sheep and goat’s milk cheeses made from local, hormone-free milk. Jones believes in the rich potential of quality milk, and has a mission to introduce the American palate to flavors found in the best cheeses of Europe. In 2010, the folks at Central Coast Creamery began developing Big Rock Blue, a rich, ivory-colored cheese laced with brilliant teal veining and a flavor profile equally as stunning. 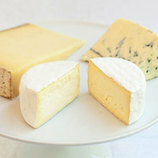 With a light pressing the cheese maintains a curdy texture reminiscent of fudge, making it ideal for towering on a cheese plate or as a crumbly addition to your favorite salad. 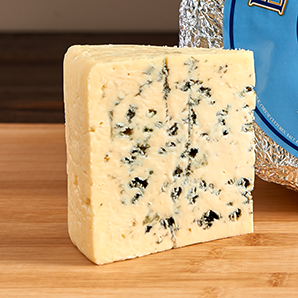 Big Rock Blue is mild and approachable yet brimming with hints of fresh butter and salty bacon.